Just as many marketers were getting the hang of Instagram, a whole new platform for ads has developed within the app. 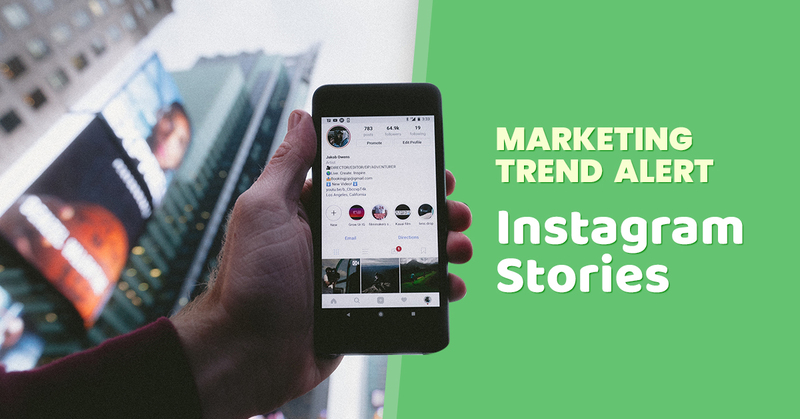 Instagram stories, which can be uploaded by any account, have reached popularity among users, celebrities, and now marketers. Borrowing elements from Facebook and Snapchat stories, these posts last for 24 hours before disappearing from the account, but can be viewed an unlimited amount of times by users while posted. Viewers cannot “like” or comment on stories, but posters can see how many views and votes their stories receive. Stories are entirely separate from an account’s typical posts and multiple can be added each day. 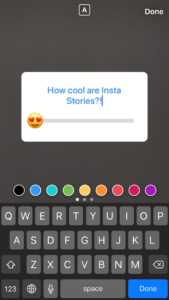 Instagram continues to improve story capabilities by introducing interactive features like locations, polls, swipe up links, and more. Posted stories appear at the top of user’s screens in the app on the home page, and on the Explore page for accounts not followed. Users and celebrities have been using stories since their debut by posting photos, live videos, tutorials, and promotional photos, but now many companies have taken advantage of this platform for marketing as well. Why Should I Use Stories for Marketing? According to Instagram, there is a total user population of over 500 million across the world, making it an extremely valuable space to reach consumers. While many brands have already made accounts and post content to their pages, stories will help them take their ads to the next level. The temporary nature of stories allows them to be perfect platforms for limited time offers, sales and promotions. They also allow brands to feature live videos to show product features, events or tutorials. While standard Instagram posts are also a great way to enhance your brand, stories can be much more targeted and personal. Also, by using the linking features on Instagram stories, viewers can instantly swipe to see your product or site. They are entirely customizable, so they can reflect your brand’s personality through various colors, stickers, GIFS, and fonts that align with your company culture. How Can I Best Use the Story Features? Instagram is constantly trying to stay ahead of their competitors like Snapchat, which means they introduce new updates almost every week. Recently, they’ve rolled out some new, interactive features that allow stories to be very influential and eye-catching. While all these new upgrades are awesome, we’ve determined which major features can help your brand’s post stand out best. By creating a poll, it allows for viewers to interact with the post and voice their opinion. This is a very valuable tool for marketers if used properly! Whether it’s having viewers vote between two different product ideas, or simply having them use the “emoji slider” to rate your company’s website- the possibilities are endless. While it can be very hard to get customers to fill out surveys or write reviews, this is a very simple way for them to quickly share their thoughts. Similar to Facebook, Instagram also allows users to stream live videos to their stories for viewers to watch and comment throughout. This is a perfect opportunity to show behind-the-scenes footage at the office, stream from company events, or show product tutorials. Many companies have partnered with influencers who often use this feature to demonstrate products. Since viewers can write-in during the live video, it is also a great way to host a Q&A session. Instead of posting links to your company’s website or blog in your bio, users can now attach links to stories. This enables marketers to drive viewers directly to the source of purchase. For example, companies could feature a product and simply have viewers swipe up to the checkout page. Links can be used across a variety of platforms like YouTube and Spotify, taking viewers directly to those apps from the story. Instagram is currently working on an entire shopping platform via stories that is set to debut later this summer. 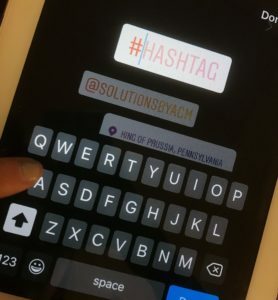 Just like in regular Instagram posts, adding hashtags and tagging other accounts is key to increasing your number of impressions. By using hashtags in a story, the story appears whenever that hashtag is searched. Tagging other accounts in your story notifies the account tagged and links directly to their page. Using both features will also help the story to appear on users’ Explore pages if the hashtag or tagged accounts link to their interests. 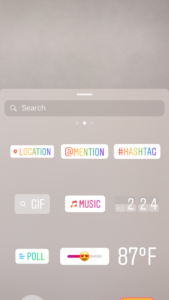 By adding a location sticker to an Instagram story, viewers can click on the sticker to see the location on a map, which is beneficial to retail stores and small businesses. In addition, when a user searches the location, the story is likely to appear in their results. Instagram also features nearby posts and stories to users explore pages. Stories are meant to be completely customizable to your personality. Marketers can use this to portray brand image through certain color schemes, fonts, stickers and more. 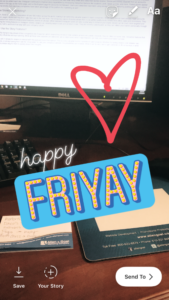 While it might not be beneficial to pile all these features onto a post at once, they are a fun way to get your story noticed! Instagram updates their stickers seasonally and introduces new filters and other updates very often. Let your company’s attitudes and vibe shine through in each story you post!